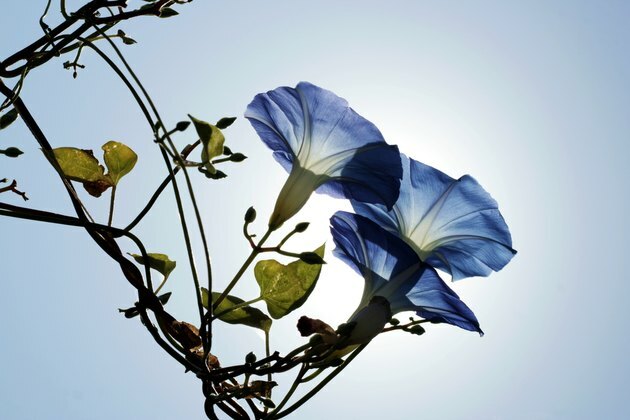 The morning glory flower blooms and dies within a single day. 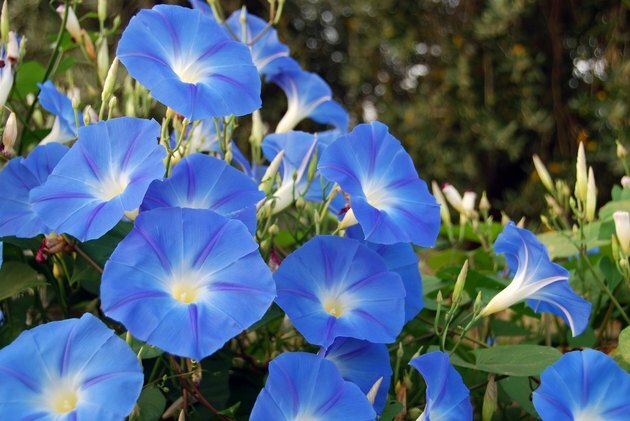 In the Victorian meaning of flowers, morning glory flowers signify love, affection or mortality. In Chinese folklore, they represent a single day for lovers to meet. They also represent the month of September and 11th wedding anniversaries. 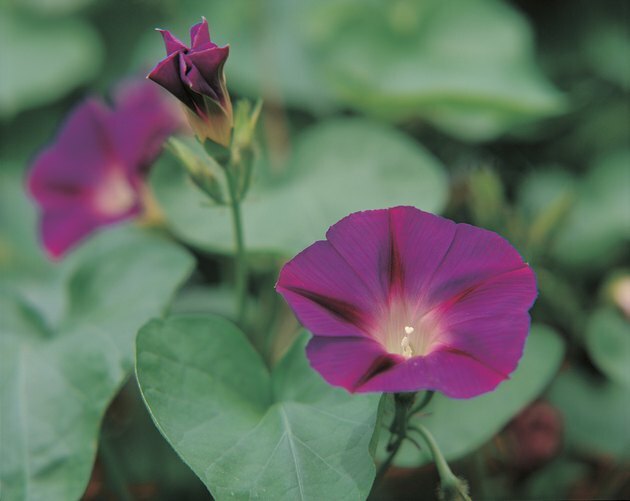 The tubular star-shaped morning glory flower primarily symbolizes affection, according to the Victorian Bazaar website. The flowers blossom in the morning and die by afternoon or nightfall, making it representative of the sometimes fleeting nature of affection. But the vine produces new flowers every day during its growth season, representing the renewable nature of love. The hardy vine grows rapidly and often is used as a colorful natural cover for walls, fences and borders. Its large funnel-shaped flowers range from dark blue to light purple in color. 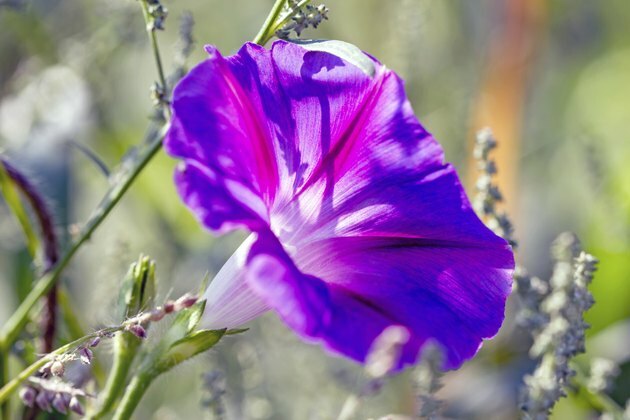 The morning glory's rigorous growth has led it to be declared an invasive weed in some areas of Australia and the United States. The name is a catch-all term for more than a thousand types of flowering vines in the Convolvulaceae family. Some varieties bloom only at night, giving them the common name of moon flower. 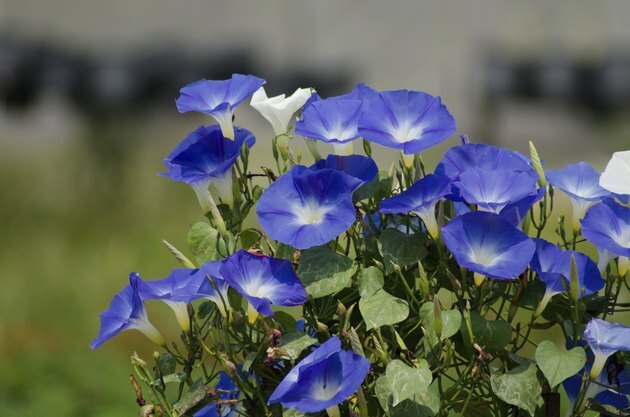 Morning glory flowers average 4 to 5 inches in length and about 4 inches in diameter although some species can reach 8 inches across, according to The Plant Expert. The vines can grow to a height of 10 feet or more depending on the support structure. When the language of flowers began in the Victorian era of the 1800s, morning glories signified love and affection, according to Victorian Bazaar. 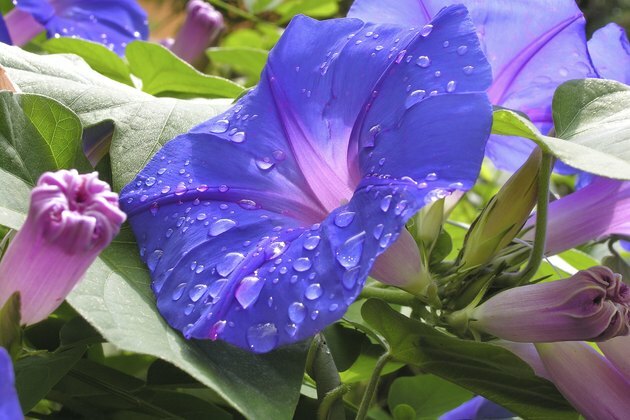 Given morning glory flower's short lifespan, it also signifies unrequited love. 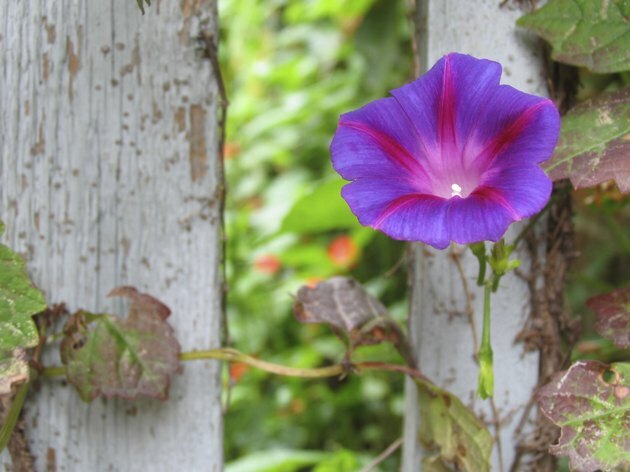 Images of morning glory vines can be found on Victorian headstones, symbolizing mortality, mourning, the shortness of life or resurrection, according to the Rochester's History website. A traditional Chinese tale attached the morning glory to young lovers Chien Niu and Chih Neu, according to the Living Arts Originals website. When the pair fell in love, they neglected their duties in caring for water buffalo and sewing. In anger, gods separated the lovers on opposite sides of the Silver River and allowed them to meet just one day each year. Wild morning glories have been traced back to ancient China where they were used for medicinal and ceremonial purposes. The Japanese first cultivated the flower for ornamental use in the 9th century. 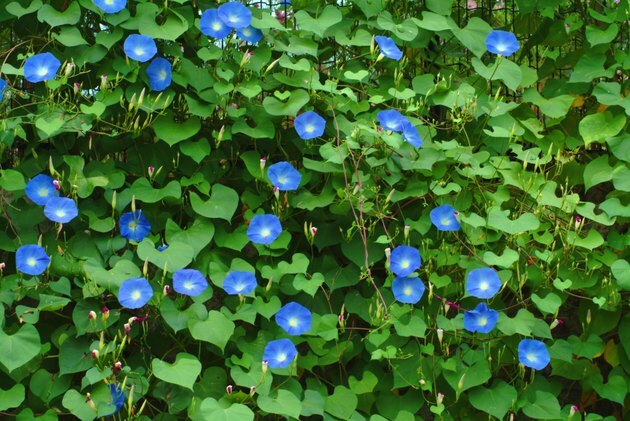 Aztec civilizations used the juice of some morning glory species native to Central America to create rubber-like substances, according to the Massachusetts Institute of Technology (MIT). Priests prized the hallucinogenic properties of the seeds for use in ceremonies. Morning glory flowers represent the month of September and are used for 11th wedding anniversaries. The seeds of some morning glory species contain d-lysergic acid amide, which has hallucinogenic properties similar to LSD. Extracting the acid is illegal in the United States.